How the Recognition of Privileged Texts in the Nineteenth-century Debate over the Bible and American Slavery Caused Me to Reconsider My View of Women’s Ordination. The purpose of this revised article is to explain to my friends, colleagues, and anyone else interested, why I left a denomination that does not permit the ordination of women and joined one that does. There is much more to say about the ordination of women than what follows, but this is a start. I began this awhile back as a series of short articles, but the flow was interrupted by a call to a new job in California and a cross-country move. I would now like to resume what I started, restating and completing what I began. My research on the Bible and the slavery controversy in the nineteenth-century was the major catalyst in my change of views regarding the role of women in church leadership. My interest in the Bible and the American slavery controversy began in 1998, while I was the pastor of a Presbyterian congregation in Eugene, Oregon. A booklet circulating in the church and throughout other congregations in the Pacific Northwest had created a stir. Southern Slavery As It Was, published by Canon Press in 1996 was authored by two ministers, one of them a member of my own denomination at the time. At the time I was predisposed to believe that my own evangelical and Reformed view of the Bible was consistent with an antislavery position. I came to realize that my training in hermeneutics -acquired in my theologically conservative seminary training and applied for over fifteen years of preaching -did not lead to antislavery conclusions. The study of the biblical debate over American Slavery in the nineteenth century unsettled me. Proslavery evangelicals seemed to read and interpret the Bible using the same grammatical and historical tools I was taught to use. In addition to their interpretation of New Testament texts, proslavery writers also found divine approval of slavery in the ancient stories of the patriarchs. No other text enjoyed more widespread appeal than Noah’s curse on Canaan (Genesis 9.25-26). Without going into a lot of detail, in the nineteenth century, Africans were assumed by most people to be Canaan’s descendants, and so the Genesis text was used to justify their enslavement. Many Americans during the nineteenth century, found in Genesis 9 the divine account of slavery’s origin and a warrant for all generations, prompting Theodore Dwight Weld’s famous comment that “this prophecy of Noah is the vade mecum of slaveholders, and they never venture abroad without it (Theodore Dwight Weld, The Bible Against Slavery, 46).” Vade mecum is Latin for “go with me,” used to describe a reference book or handbook that is carried at all times. Noah’s curse was an indispensable and privileged text that was kept close at hand in the proslavery argument. My understanding of privileged texts was an “aha” moment for me with respect to women’s ordination. I began to see that arguments regarding the issue of women’s ordination did not simply reflect different interpretations of texts, but also involved valuing some texts over others. Some texts were deemed more important than others. 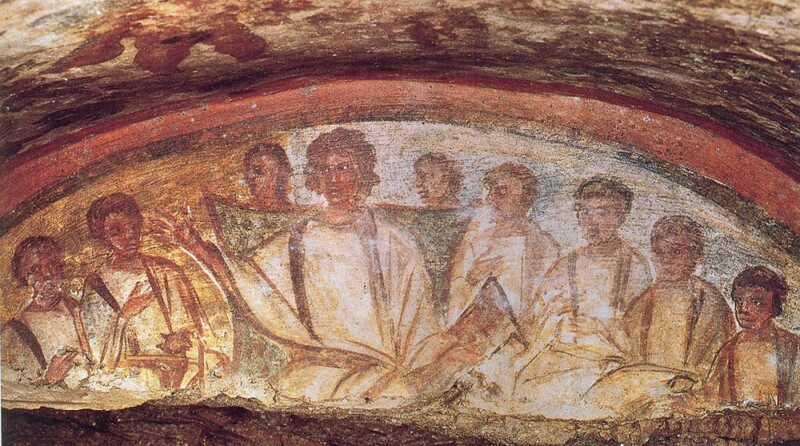 Antislavery writers also drew from the Old Testament. Eli Washington Caruthers – of particular interest to me as the subject of my dissertation- elevates Exodus 10.3 – Let my people go that they may serve me – giving it a kind of privileged status over all of the texts in the Bible that spoke about slavery. For Caruthers and other antislavery writers, the Exodus text was the most important text about slavery because God’s intervention in the history of the Hebrew people demonstrated divine disapproval of slavery and support for the abolition of slavery in all times and places. How Does a Text Become or Remain “Privileged”? For traditional Protestants who believe in the authority of Scripture as expressed by Paul in 2 Timothy 3.16-17, all Scripture is important: All Scripture is God-breathed and is useful for teaching, rebuking, correcting, and training in righteousness that the man of God may be fully equipped for every good work. Many questions of interpretation may be resolved when texts that are more clear help us interpret the less clear. As the Westminster Confession of Faith notes, when there is a question about the true and full sense of any Scripture … it may be searched and known by other places that speak more clearly (1.9). Beyond this general principle of interpretation established in the confession, my “discovery” was that there are usually texts in the course of debate that are championed by opposing sides, and which bring a singular clarity to the issue at hand for those who are dependent upon them. But how do we know who is correct in arguments that are dependent upon privileged texts? What I have learned from the Bible and the American slavery debate is that a text so employed continues to demonstrate its importance and viability. If it does not, its privileged status and any arguments associated with it, are diminished. In the case of Genesis 9 and the curse of Noah, the nineteenth century proslavery arguments elevating, and dependent upon it, could not be sustained. Significantly, their understanding of the text has generated no significant or meaningful theological posterity. The commitment of proslavery forces to the Genesis 9 text was a theological dead end for them and for the usefulness of the text. But, as I argue in my dissertation, the belief of Eli Caruthers and other antislavery writers in the supremacy of the Exodus text has been demonstrably borne out by the current theological literature. Who, today, can doubt the primacy of the Exodus text and the exodus story in the theology of Paul? Studies in Exodus continue to reveal its importance as it generates insights for the the issue of slavery, as well as our reading of other New Testament literature (e.g. Sylvia Keesmaat Paul and His Story: (Re)Interpreting the Exodus Tradition; John Byron Recent Research on Paul and Slavery; Richard Hays Echoes of Scripture in the Letters of Paul). My research on the Bible and slavery led me to suspect that the controversy surrounding women’s ordination, like the American slavery debate, involved certain privileged texts, texts which are appealed to as especially clear or instructive on the issue at hand. In the debate surrounding the ordination of women, one text is especially privileged: 1 Timothy 2.11-12. The singular importance of this text for arguments against the ordination of women to pastoral ministry cannot be overstated. Douglas Moo’s comment that this text is “[o]ne important reason” for “certain permanent restrictions on the ministry of women” is surely an understatement (“What Does It Mean Not to Teach or Have Authority Over Men? 1 Timothy 2:11-15” Recovering Biblical Manhood and Womanhood: A Response to Evangelical Feminism, eds. John Piper, Wayne Grudem, 179). Arguably, no other biblical text is cited as much nor could arguments against women holding office in the church be sustained with such certainty were it not for 1 Timothy 2. To get a sense of the weight it carries, one need only turn to the biblical citation index of their favorite book on this issue to see the multiple times the text is cited. But should it be so privileged? First of all, I think the application of the passage is bound by the unique problems of Ephesus during Paul’s era. The larger setting of the text in 1Timothy 2 commands specific behavior that is culturally limited. Paul’s commands for men “to lift up holy hands in prayer (v.8)” and for women to not wear “gold or pearls or expensive clothes (v.9),” are limited to the cultural context or situation. For this reason, I think it is best to understand the entire passage of 8-15 as addressing particular circumstances, therefore not to be universally applied. Secondly, if someone does want to assert that 1Timothy 2.11-12 is what Paul believed was applicable to all women of every place and era, one has to reconcile such a view with other things he teaches regarding women. Some of what he writes, at the very least, would seem to allow for the development of doctrine regarding women that would contradict a traditional view of 1Timothy 2. Arguably, as such texts continued to be considered and studied, they will demonstrate their viability and prove in the future to deserve greater privilege in the debate (e.g., Romans 16.3,7; Galatians 3.26-28; 1Cor.11.5). Finally, I would like to point out two important and recent concessions or revisions in the traditional view of the text which, in my opinion, seriously undermine its privileged status in the debate. I believe these revisions are fatal to the traditional view in the future of Christianity. The first concession regards the numerous exceptions, allowances, special circumstances, etc., that are now practiced by evangelicals nearly everywhere but which are plainly contrary to the traditional view of the text. A typical evangelical interpretation of these verses usually involves a thorough explanation of the words and grammar. But once this is accomplished a more nuanced interpretation or application is usually recommended, one that is not so hard-lined as the traditional view of the text sounds. Fortunately, these more nuanced interpretations are friendlier to evangelicals like Elisabeth Elliot and others, allowing for a host of exceptions and circumstances and possibilities for women to teach and/or exercise authority. But these nuanced readings leave us with a very different impression than the Apostle’s words originally conveyed in the traditional view. Women cannot teach men in the church, but an occasional lecture might be okay, or maybe on the mission field, or perhaps if they are not elevated at a podium in front of the congregation but instead behind a lectern in the fellowship hall, etc. Those holding to the traditional view probably know that such allowances mark a significant departure from evangelicals of the nineteenth century or even those of just a mere twenty-five or thirty years ago. Certainly the church fathers- from whom we have largely acquired the traditional view of 1Timothy2 – would never have allowed such concessions as we have today. For the most part, they believed in the inferiority of women and upheld an interpretation of the text that was not so accommodating. John Chrysostom spoke for many when he asserted that women, collectively, were weak and fickle and that the Apostle Paul in this verse and others like it wanted men to have preeminence in every way over women. Augustine’s comment on Genesis 2 was typical of the church fathers: he couldn’t really think of any reason for the creation of woman as man’s helper, except, perhaps, for procreation. Traditionalists today hold to a view that is a only a shadow of what the traditional view once was. The other revision or concession which practically goes unnoticed in the traditional view is the narrowing of the text’s application to the church. Evangelicals who hold to the traditional view often point out that it is only in the church that women must be restricted and not have authority over men. Most evangelicals today who hold to the traditional view believe that outside of the church, in other situations or spheres of life, a woman may have authority over a man. As you might deduce from the statements above by Chrysostom and Augustine, that isn’t what the traditional view used to mean! It is important to understand that the church fathers, like many evangelicals today, believed that the text was founded upon a principle of creation. In their thinking and those who follow their logic, the basis of a woman not having authority over a man is founded upon the order of creation as they believe it is being explained in the text. Adam came first the text says, then Eve, etc. Here is the problem with this argument from creation and the concession or allowance that is being made nowadays: Let’s assume a universal restriction on women having authority over men is being asserted by Paul in the text. Let’s also assume that the basis of his restriction is a principle he believes is drawn from the order of creation. If these things are true then what is the reasoning that allows us to limit the restriction to the church? If it is wrong in principle for a woman to have authority over a man, how can there be allowance for ignoring such an important principle in our larger society? If the principle is from creation, then isn’t it valid, by extension, for all of society? If Paul is establishing a role relationship for the church, isn’t that role relationship valid for all institutions and circumstances? Shouldn’t those who believe a principle of creation limits women in the church, be concerned about a woman sitting on the Supreme Court and exercising authority over men? I cannot think of another example of Christian teaching that we understand as rooted in creation but think is only applicable to the church and not all of society. But evangelicals have redrawn the interpretive line in the sand to allow for their daughters to have successful careers as executives, jurists, and professors, but not as ministers or teachers in the church. For those who have privileged 1Timothy 2.11-12, the text has universal meaning for the church and women for all time. Rather than understanding verses 11-12 of the passage as situationally and culturally limited – as nearly everything else the Apostle says throughout the chapter is usually understood – this text has been singularly exalted to a position of universal application for all times and places. Just as Noah’s curse on Canaan in Genesis 9.25 functioned for American slavery, so 1Timothy 2.11-12 is the vade mecum for the argument against women’s ordination. It is the indispensable text. Nowadays, of course, no one would allow for Noah’s curse on Canaan to be a justification for the enslavement of a race. We can be glad that in the case of the slavery controversy, other texts began to rise in importance that seemed to resonate more with God’s redemptive plan and thus the status of Genesis 9.25 diminished over the years. I envision a similar fate for the privileged status of 1 Timothy 2.11-12 in the debate over the role of women in the church.